Recently, friends and I met up at a neighborhood eatery for an early dinner. Perusing the menu, I was delighted to see beer can chicken—this one served with carrot top chimichurri sauce. Sold. For me, beer can chicken is a sentimental favorite. I actually owe my long working relationship with Steven to the dish. Back in the summer of 2002, he was on tour promoting his latest book, Beer-Can Chicken. Steven’s publisher, Workman, hired me the afternoon before his Ohio visit to handle food styling duties and drive him to local media and bookstore events, the first of which was occurring at 6 a.m. the following morning. Printed recipes in hand, I rushed to the supermarket to find the most comely-looking roasters they had, worthy beer, and the spices needed for Steven’s ever-popular All-Purpose Rub. I spent a sleepless night preparing for his live demos and barbecuing the “swap-outs,” i.e., the finished camera-ready chickens. 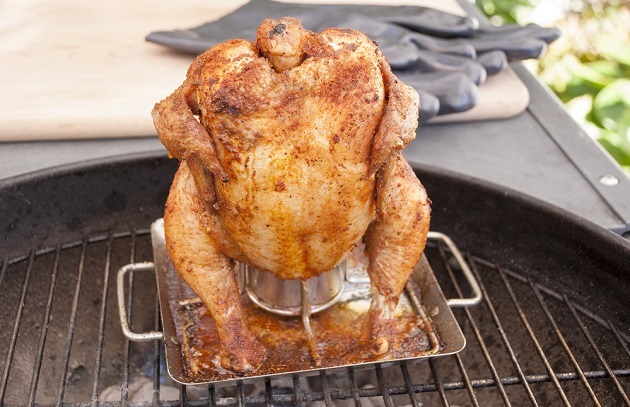 The idea is startlingly simple: You grill a chicken upright over an open can of beer. What results is the moistest, most succulent, and most flavorful chicken you’ve ever tasted. The dish is also infinitely customizable—Beer-Can Chicken proved that—and once you have the basics down, it can be adapted to any barbecue culture. Jamaican jerk. Oaxacan mole. Chicken tikka or tandoori. Simply vary the rub, the marinade, or the beer or other liquid. One of my favorite variations was a winner years ago in an extreme grilling contest sponsored by our website, barbecuebible.com. It was submitted by Louis Kiss, then (and maybe still) a special effects artist in California. It’s perfect for fall, and especially appropriate for Halloween parties; you still have time to audition it for the latter. To make it, follow the instructions for Steven’s basic beer can chicken, but use your favorite pumpkin beer or ale (if bottled, transfer to an empty beer or soda can) and the Pumpkin Spice Rub below. • For more flavor and succulence, brine the chicken before cooking. Start with 1 gallon of water or other liquid, such as apple juice, and 1/2 cup of salt, adding aromatics (citrus peels, onion, whole spices, etc.) as desired. Cover and refrigerate for 8 to 12 hours. • Do serve with an interesting sauce. For inspiration, see Sauces, Rubs, and Marinades. • The recipe above directs you to pour half the beer out of the can before perching the chicken on it. Drink it, soak wood chips in it, or pour it in a shallow heatproof dish, like a pie tin, to maintain a moist environment in your grill or smoker. • To avoid rubbery skin, smoke-roast the chicken at temperatures high enough (325 to 350 degrees) to render the fat. Add smoke with wood chips that you have previously soaked in water or other liquid, then drained. • For stability on the grill grate, invest in a beer can chicken roaster. Otherwise, steady the chicken in a baking dish or disposable foil pan. • Never roast a chicken on bottled beer (transfer to an empty can) or an unopened beer or soda can. • To encourage even browning, rub the chicken all over with vegetable oil, olive oil, or melted butter before applying a barbecue rub. • Once the chicken is positioned on the grill grate, plug the neck cavity with half a lemon, lime, or small onion. This helps retain moisture in the bird. • For extra crisp skin, place the chicken, breast side up, on a wire rack over a rimmed baking sheet. Refrigerate, uncovered, for several hours. • Insulated rubber gloves are a big help when transferring the chicken from the grill to a cutting board and extricating the steaming hot can. • For a more professional-looking presentation, fold the wings behind the chicken before smoke-roasting. Combine all the ingredients in a small bowl and mix with your fingers to break up any lumps. Makes enough rub to season one chicken. Have a favorite beer can chicken recipe or tip? Tell us about it by leaving a comment here or tagging us on Facebook, Instagram, or Twitter.